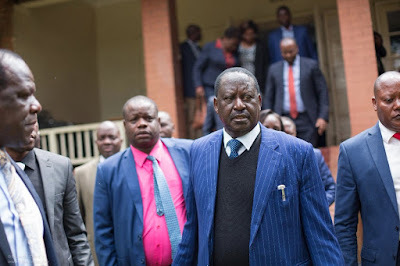 Wednesday August 1, 2018 - National Super Alliance (NASA) leader, Raila Odinga, has dismissed claims that he betrayed other NASA co-principals when he met President Uhuru Kenyatta on March 9th. On that day, Uhuru and Raila resolved to bury their political differences and work for a united Kenya. However, after meeting Uhuru, Musalia Mudavadi, Kalonzo Musyoka and Moses Wetangula accused the aging politician of being betrayer for meeting Uhuru alone. But in an interview with Citizen TV on Tuesday, Raila said he did not leave his colleagues out of the handshake because this was just a starting point for a long process of healing the country. “These talks had to begin somewhere," Raila stated. The former Prime Minister also revealed that that he briefed his colleagues in NASA about his deal with President Kenyatta saying nothing was secret.